Virtual Reality Mobile App development will completely rewrite the way your customers experience, shop and communicate. They will be able to make intelligent purchase decisions. VR App development aids in creating highly creative and visually stunning presentations and demos. Iterations and modifications can be performed instantly and easily. Virtual Reality e-commerce apps are interactive, which will aid in increased sales and revenues as well as improved customer engagement. Virtual Reality Mobile Apps present a new, innovative marketing channel. They can boost your marketing and branding strategy. By embracing cutting-edge technology like Virtual Reality Mobile Apps, you get an edge over your competition in captivating the interest of your customers. Improved Loyalty and stronger relationship with customers. With low cost, faster production cycle, VR Mobile Apps give the best ROI for your business. E-commerce – This is one industry that can reap the maximum benefit. 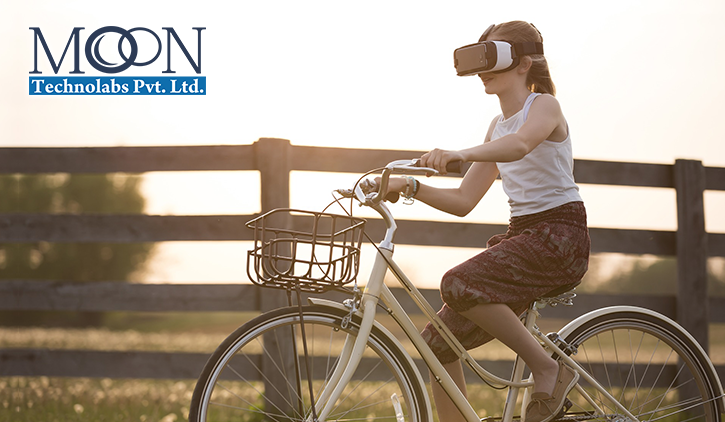 Virtual Reality enables best shopping experience by quick browsing, easy shopping and faster checkout, and high levels of customer satisfaction. Education & Training – Develop visually stimulating and interactive learning for the students, that lead to better memory retention, thus increasing training efficiency and reducing risks. This is of particular importance in the field of medicine. Tourism & Travel – Enables an incredible viewing experience of the famous places you want to visit, from the convenience of your home. Real Estate – Create impressive virtual tours of your properties to prospective buyers, rather than blueprint plans on papers. Entertainment & Games – Create innovative and futuristic games and movies for enhanced viewing pleasure. It is clear that Virtual Reality Mobile Apps are going to dominate the future of mobile usage and transform m-Commerce to v-Commerce. As an SME business owner, it is prudent that you embrace the trend. At Moon Technolabs, we are one of the leading Mobile App development companies in India. We have delivered 350+ apps and 550+ projects to more than 250+ satisfied clients all over the world. We are perfectly poised to deliver innovative, futuristic Mobile Apps that can boost your company revenue.